Giants closer Rod Beck got into trouble in this September 1992 game, as in bases loaded trouble, but Beck got himself out of it, according to The Associated Press. "Even when the bases get loaded, nothing seems to bother Rod Beck," manager Roger Craig told The AP after that game. "It doesn't seem to matter." Beck was just getting started. He went on to become one of the game's top closers. He saved 48 games the next year and later a career high 51 in 1998. By the time Beck was done, he'd seen time in 13 major league seasons, made three All-Star games and saved 286 big league contests. Beck's career began in 1986, taken by the Athletics in the 13th round of the draft out of Grant High School in Van Nuys, Ca. Beck started at short-season Medford. 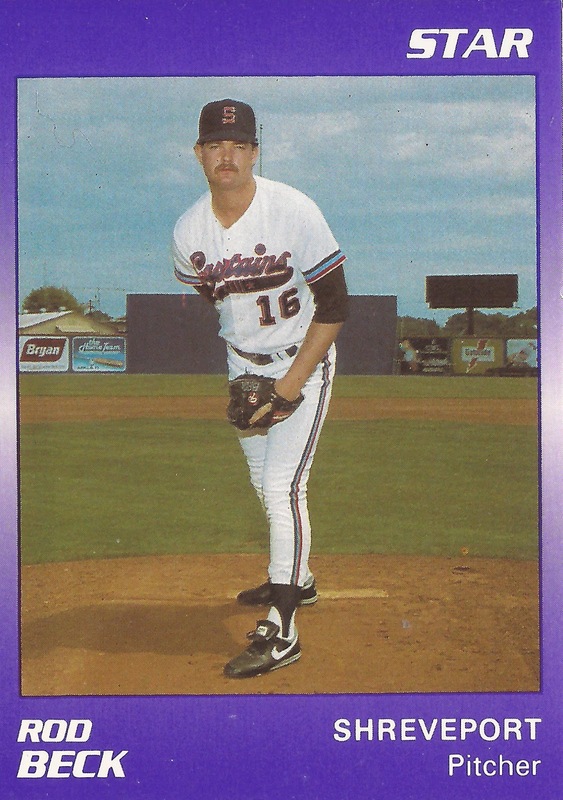 He made single-A Clinton in 1988, then AA Shreveport in 1989. He played 1990 between Shreveport and AAA Phoenix. The future major league closer actually pitched that early career largely as a starter. In 1991, back at Phoenix, Beck made the transition to reliever. In 23 outings, five starts, he went 4-3 and picked up six saves. He also debuted with the Giants in May, getting 31 relief outings and a 3.78 ERA. Beck then returned to the Giants for all of 1992, turning in a sterling 1.76 ERA over 65 outings while notching 17 saves. He then saved 48 in 1993, earning his first All-Star selection. From 1993 to 1998, Beck saved at least 28 games each year. He remained the Giants closer through 1997, getting to the All-Star game twice more, in 1994 and 1997. He moved to the Cubs for 1998, helping the club to the wild card, saving 51 games. He told The AP the next spring he looked for save percentage, not necessarily the number of saves, in judging success. "What I start out every year in spring training is to get the best percentage of saves I can with the opportunities I'm given," Beck told The AP. "Other than that, the rest of it is out of my control." Beck's career then went on a decline. He saved just 10 games in 1999, playing between the Cubs and the Red Sox. He got into 34 games for the Red Sox in 2000, then came back for 68 in 2001. He saved six games that year. Beck also became a fan favorite, driving an RV around during his year off and then to AAA Iowa after he signed with the Cubs. He got into 21 games there, hanging out with fans after games. "A guy like him comes around once in a lifetime," Padres reliever Kevin Walker told The AP of Beck in February 2004. "He's an awesome guy. He's very nice. And he's got a closer mentality, which is no fear. Before the game, during the game, he's all fun, but when it's time for him to get ready, he's serious." Beck pitched his final games in 2004. Towards the end of his career, Beck fought drug addiction. An October 2007 ESPN article describes the last years of his life and his losing addiction battle. He passed away in June 2007 at the age of 38.